If you want to maintain a relationship with Mexico, even the long distance kind, you have to accept upfront that pain and disappointment come with the territory. You know full well that, sooner or later, politicians fail you, friends betray you, heroes disappoint you, lovers leave you, and life breaks your heart. So then, perhaps it is no great surprise that many Mexicans---and to a lesser extent, many Mexican Americans---living in the United States should, in the last few years, have found themselves looking south in anguish as their ancestral homeland gets torn apart by an increasingly brutal war between the Mexican government and a handful of powerful and ruthless drug cartels fighting for their very survival. As someone whose grandfather came to the United States legally during the Mexican Revolution and made a future here because Mexico refused to make room for him and others like him, I don’t owe Mexico a damn thing. We’re talking about a country of unimaginable beauty and enormous natural resources that has long been plagued by corrupt politicians, inept bureaucracies, and severe inequalities that often lead its citizens to prey on one another. And yet, when it comes to the drug war, I view those developments with a heavy heart. The war has now claimed the lives of more than 28,000 Mexicans---with no end in sight. Billions of dollars in tourism revenue and foreign investment have been lost. And, in a disturbing sign of the times, Mexican schoolchildren are now being taught to duck under their desks in the event of random gunfire. No wonder international organizations are issuing dire warnings about how Mexico is on the brink of collapse right alongside Pakistan. As a terrorized population searches frantically for an exit door, many of the country’s most valuable institutions are dangling over the precipice. This is so because many Mexicans, disregarding Benjamin Franklin’s warning about trading freedom for security, are eager to strike just that sort of deal. In fact, according to the polls, some Mexicans seem to actually be pining away for the days when the corrupt and discredited Institutional Revolutionary Party (PRI) ran the government. What a comeback story this has been. Just four years ago, after losing two presidential elections in a row, the PRI was considered by many to be headed for extinction. No longer. Now it’s favored to retake the presidency in 2012. And it’s all because of public discontent over the drug war, the blame for which votes put at the feet of the National Action Party (PAN). The one bright spot for the PAN is that, in a recent slate of elections for state and local offices, the party did a surprisingly good job of holding off additional gains by the PRI---and what are presumed to be their major backers, the drug cartels. Using violence and intimidation, the drug traffickers tried to influence the outcome of the elections, which included contests to determine who would occupy governorships of a dozen states. Let’s consider how the drug lords got into politics in the first place. There was once a gentleman’s agreement that let the cartels conduct their business while politicians lined their pockets and looked the other way. Those days are over, but now the PRI wants another run at the chicken coop. To help it retake the presidency, the party has signaled that it would call off the war and pursue an appeasement strategy with the drug traffickers. These peddlers of misery would be allowed to stay in business and export their product to Canada and the United States. And life in Mexico could go back to normal. The message to Mexico’s voters is that if you want more of the war, vote for the PAN. But if you want a return to peace and tranquility, vote for the PRI. So what happened? The voters stood up and helped the PAN beat back the PRI. And because it has become known all around Mexico as the anti-drug cartel party, any victory for the PAN is a victory in the war on drugs, for President Felipe Calderon, and for Mexico’s relationship with the United States. Americans should pay attention to all this since, unlike Las Vegas, what happens in Mexico never stays in Mexico. It spills into the United States. It impacts the three policy areas that form the backbone of the relationship between the countries: trade, immigration, and drugs. Besides, the United States has pledged, via the Merida Initiative, $1.4 billion to help Calderon fight the drug lords. And we must protect that investment. Lastly, quite unexpectedly, the drug war in Mexico is also impacting our electoral system here in the United States. Take the state of Arizona, where Gov. Jan Brewer turned Mexican drug cartels into the Willie Horton of the immigration debate. The Republicans figured out that Mexican drug dealers are, to average Arizona, much scarier than Mexican dishwashers---or housekeepers, or gardeners, or any number of occupations done by all those illegal immigrants that Arizonans love to hate and yet can’t seem to stop hiring. ¡Ay caramba! Talk like that makes you want to grab for your Winchester. Later, Brewer doubled down on the drug demagoguery---the Mexican Connection, if you will---during a debate between Republican gubernatorial candidates. She claimed that most illegal immigrants act as drug mules for Mexican cartels. I’ll second that. In my many conversations with Border Patrol agents and supervisors over the last 15 years, I have been thoroughly disabused of any notion that drug smugglers dabble in immigrant smuggling and vice versa. Everyone stays in their lane in the border businesses, so no one loses his head. God knows, there is enough of that going on in Mexico already. The story of Mexico wasn’t supposed to unfold this way. Academics and others who have studied Mexico over the last few decades would have likely predicted that, if anything were going to split the country at the seams, it would have been social upheaval based on economic inequality or perhaps a political insurrection. Mexico has always been a country of rich and poor people, with very little gray area in between. Its economy is hopelessly tied to that of the United States, so when its neighbor goes through bank bailouts and high unemployment, Mexico goes along for the ride. And the ride is made all the more bumpy given that---as former U.S. Ambassador to Mexico Tony Garza used to say---the country lacks an economic plan that goes beyond oil revenue and remittances from Mexicans in the United States. On top of all this, as democracies go, Mexico is still a newborn. This year marks the 100th anniversary of the start of the Mexican Revolution and the 200th anniversary of the beginning of Mexico’s war for independence from Spain. But having the right to vote and knowing that your vote will count for something are two different things. And for much of the last century, Mexico’s democracy has been tainted by corruption and allegations of election tampering. The PRI controlled the government for 71 years, through much of the 20th Century. It’s a tradition that the PRI had every intention of extending if Vicente Fox and the PAN hadn’t had other plans and won the presidency in 2000. Six years later, thanks to the victory by Calderon, the party maintained the reins of power. 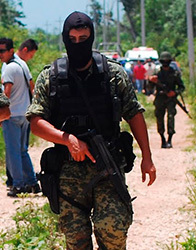 But just about ten days after he was sworn in, Calderon stirred a hornet’s nest when he sent the first contingent of army troops to battle drug gangs in his home state of Michoacan. Calderon was just getting warmed up. To date, Calderon has deployed more than 45,000 troops, along with 5,000 federal police officers, to 18 Mexican states. But the hornets weren’t intimidated. Hundreds of soldiers and police officers have been killed in the drug war, and yet even those deaths are a fraction of the overall casualties. It is all part of a campaign of terror --- grenades tossed into public festivals, soldiers kidnapped and killed, the assassination of public officials, etc. --- intended to convince the Mexican people that they would be better off if they got rid of the PAN and returned the PRI to power. It hasn’t helped Calderon (or his relationship with the United States) that there have been reports of excessive brutality by the Mexican military. As reported in the Washington Post and other publications, there are serious allegations of torture, abductions, and other forms of abuse by the Mexican military. Much of it is supposedly in retaliation for the torturing and killing of soldiers by drug cartels. What choice does Calderon have but to rely on the military? Local and state police aren’t much better since many of them subsist on bribes from the drug cartels. In fact, Calderon recently proposed to Mexico’s Congress that the country’s nearly 2,000 municipal police forces be consolidated with 32 state agencies that he believes will be better equipped to take on the country’s criminal syndicates. Still, Calderon has to get to the bottom of these allegations of abuse against the military and punish those who are responsible. If this doesn’t happen, U.S. support for the drug war could wither away and the funding could dry up. Yet Calderon should press ahead with the crackdown on the cartels. That includes continuing efforts to go after what is, along with drugs and guns, the third leg of the drug trafficking stool: cash. Every year, tens of billions of dollars a year stream into Mexico, drug profits headed for the pockets of drug traffickers. Much of the money is laundered through cash transactions for expensive homes and other high-ticket items. Recently, in an unprecedented attempt to crack down on that intricate web of money laundering and cash smuggling, Calderon proposed a sweeping set of new measures that makes it illegal to buy real estate in cash and limits the purchase of vehicles, boats, airplanes and luxury goods to 100,000 pesos in cash, or about $7,700. The Mexican president caught plenty of grief for even suggesting such a thing, but he’s on the right track, and he is going after exactly the right target: drug money. U.S. government officials say that intercepting and confiscating as much of this cash as possible---ideally, as much as a billion dollars a year---is essential to combating the drug trade. The cartels need readily available funds to operate, or they’re out of business. Traffickers can stand to lose a few shipments of drugs, or have stockpiles of weapons confiscated. But, officials say, currency is harder to replace. If the drug cartels have a weak spot, it could well be cash seizures. Unfortunately, according to the Washington Post, U.S. and Mexican authorities are managing to seize at most 1 percent of the drug cash streaming across the border. The cartels write that off as a rounding error or the cost of doing business. Beyond better tactics, Calderon also needs better public relations. He should make the case to the Mexican people that the drug war is about nothing less than saving Mexico from a band of terrorists who represent the single greatest threat the country has faced in its history. That makes this battle noble and worthy of support---and anyone who stands in its way less so. That’s easy to say from this side of the border, but that doesn’t make it any less true. After all they’ve suffered and endured, the Mexican people have a right to be angry. But at whom should they direct that anger. The first answer is always the same: Los Americanos. Sometimes they have a point. As when they argue that Americans are subsidizing the drug war by consuming narcotics and supplying the latest weaponry to the cartels. Sometimes they don’t have a point. As when they look north and shake their fists at, of all things, a cartoon. American cartoonist Daryl Cagle recently came under fire south of the border after drawing a Mexican flag with a provocative twist. The flag is supposed to feature an eagle perched on a cactus, devouring a snake. In Cagle’s version, a slain eagle in the center, riddled with bullet holes and lying in a pool of blood. Cagle said his drawing, which went out to more than 800 newspapers around the world and has been published in at least two newspapers in Mexico, was intended to draw attention to the horrible violence in the country. Instead it stirred anti-American sentiment and provided Mexicans with a familiar and convenient foil. The Mexican newspaper El Universal, which ran the cartoon, heard from many readers who complained. “It is a shame,” said one, “that a patriotic symbol like our flag, which is so beautiful to me, can be mocked by a stupid cartoonist.” Even the Mexican Embassy in Washington, which must not have more important matters to deal with, got into the act. ¡Dios mio! This whole controversy belongs in the funny pages. As someone who has tried to keep an eye on the drug war since Calderon heroically went to battle against the cartels, I find myself shaking my head now and then. For instance, when the war started, polls by Mexican newspapers showed that, while most Mexicans supported the mission, a similar-sized majority also thought the enterprise would ultimately turn out to be a miserable failure. Confused by this cocktail of faith and fatalism? Welcome to Mexico. Now I’m shaking my head again. I was beginning to wonder whether the Mexican people would ever get passionate about anything having to do with this crusade. Now we know. But what bothers the Mexicans? A cartoon. I can’t say I’m surprised. This isn’t exactly a good time for free expression south of the border. For one thing, it’s open season on Mexican journalists who cover the drug trade and are being murdered while trying to report their stories. The message: Mind your own business. Apparently, even though often depicted in movies and the pop culture as folk heroes and immortalized in song, drug traffickers would kill for some privacy. And they have---often. Dozens of journalists have been murdered in Mexico since 2000. A few months ago, El Diario de Juarez, the largest newspaper in Ciudad Juarez, essentially surrendered to the city’s drug cartels by asking for a truce and an end to the violence that had resulted in the death of two of its journalists. In a front-page editorial, the newspaper asked the cartels what they want from its coverage so the staff can go to work without worrying about death, injury or intimidation. The newspaper’s editor told the Associated Press that he and his staff didn’t want to be “cannon fodder” and that they had lost confidence in the Calderon government’s ability to protect them. And so they decided to plead their case directly to the entities that decide their fate---the drug cartels. What a heartbreaking story. Mexico can be a world-class country, but it has to start acting like one. And thanks to the drug war, it has the chance to do just that. Benjamin Franklin had it exactly right. Those who would sacrifice liberty for security deserve to have neither. It’s true on this side of the border, and true on the other.